NEW YORK (WABC) -- New York City launched a new campaign on Monday, affirming every New Yorkers' right to use the bathroom consistent with their gender identity. "No one deserves to be denied access to bathrooms or discriminated against for being who they are. Every New Yorker has the legal right to use the bathroom consistent with their gender identity, no questions asked - and these powerful ads affirm this right," said Mayor Bill de Blasio. The campaign, which kicks off LGBTQ Pride Month, includes ads and videos featuring transgender New Yorkers and instructs readers to "look past pink and blue" and to "use the restroom consistent with who you are." The ads will appear in subway cars, bus shelters, phone booths, ethnic and community newspapers, and in ads in digital publications and across social media. The campaign ads and videos were created following audience research with transgender and cisgender New Yorkers and input from transgender community and legal advocates. 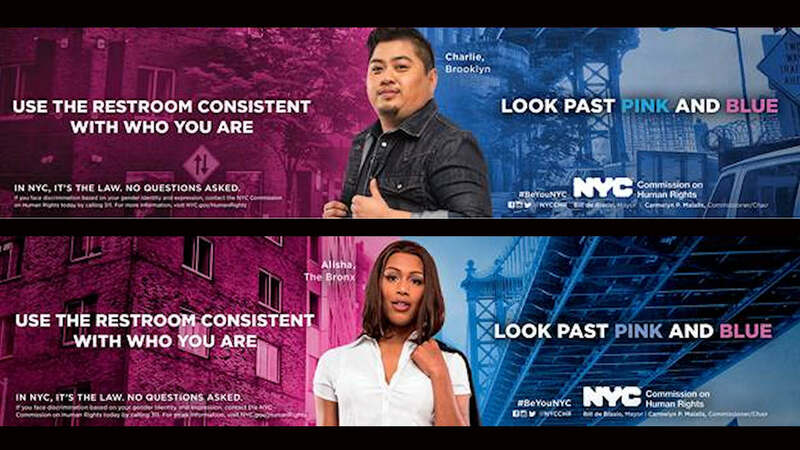 The ads feature real transgender New Yorkers. The ones featured above include Alisha King, a Bronx resident and full-time mom, and Charlie Solidum, a Brooklyn resident and health care professional.